Typhoon Lionrock's rainfall rates and cloud heights were analyzed as it continued to intensify when the Global Precipitation Measurement mission or GPM core satellite passed overhead. Since Aug. 15, 2016 Japan has been by hit by three tropical cyclones called Mindulle, Chantu and Kompasu. Tropical cyclone Lionrock may be the next to affect Japan. Lionrock formed east of Japan on Aug. 18, 2016 and passed by to the south of Japan as a tropical storm. Lionrock then interacted with tropical storm Mindulle which spun by to the east. Mindulle, although somewhat weakened by Lionrock's outflow, hit Tokyo killing at least 2 people. Lionrock moved to the southeast of Okinawa and became a powerful typhoon. The GPM core observatory satellite passed over typhoon Lionrock twice in two days. On Aug. 23 at 2:11 p.m. EDT (1811 UTC) GPM saw Lionrock when it was first classified as a typhoon. At that time, Lionrock had winds of about 75 mph (65 knots). GPM's Dual-Frequency Precipitation Radar (DPR) instrument sliced through the western edge of the typhoon's eye. Rainfall was measured at a rate of over 222 mm (8.8 inches) per hour in intense storms on that side of the eye wall. Lionrock was a much more powerful typhoon with winds of about 115 mph (100 knots) when the GPM satellite flew over again on Aug. 24, 2016 at 3:31 a.m. EDT (0731 UTC). This made it a category three on the Saffir-Simpson hurricane wind scale. GPM's Microwave Imager (GMI) showed an area of very heavy precipitation occurring just southeast of the powerful typhoon's eye and intense rainfall within bands of thunderstorms feeding into the center of circulation. GPM's Radar (DPR Ku Band) sliced through Lionrock and those data were used to show a 3-D cutaway view of precipitation structure within the typhoon. DPR showed that some of the tall thunderstorm towers in Lionrock's eye wall reached heights almost 17 km (10.5 miles).GPM is a joint mission between NASA and the Japan Aerospace Exploration Agency. 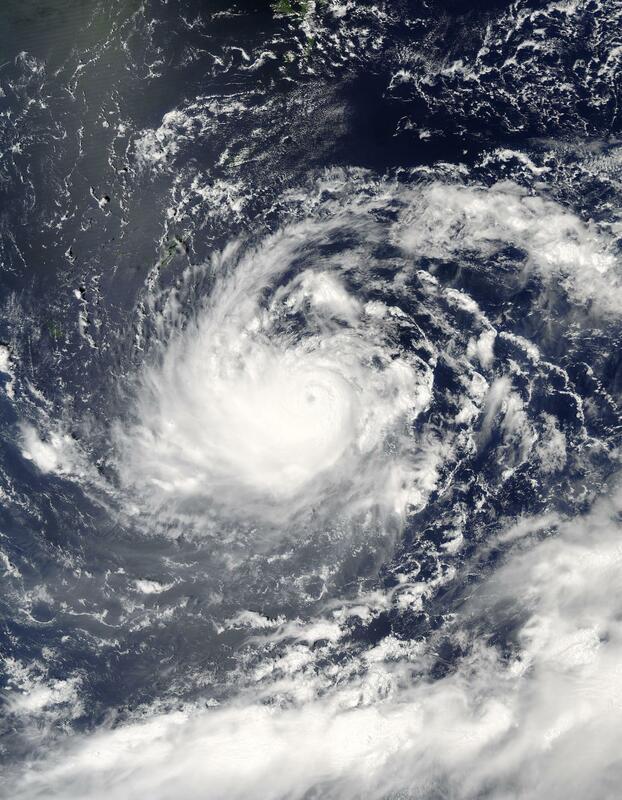 At 11 a.m. EDT (1500 UTC) on Aug. 25 Typhoon Lionrock was centered near 23.7 degrees north latitude and 131.1 degrees east longitude, about 246 nautical miles southeast of Kadena Air Base, Okinawa, Japan. Lionrock has tracked northeastward at 3.4 mph (3 knots/5.5 kph). Maximum sustained winds were near 126.6 mph (110 knots/203.7 kph). Typhoon Lionrock is expected to continue tracking to the northeast and maintain typhoon strength as it heads toward Honshu, Japan's main island by Aug. 29 and Aug. 30.